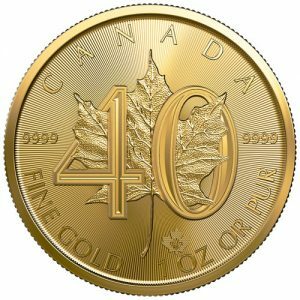 When it began in 1979 as a trial project to transform Canadian gold into pure gold investment coins, few could have predicted the runaway success and staying power of the highly-acclaimed Gold Maple Leaf bullion coin, with nearly 30 million ounces sold to date. Forty years later, it is the world’s favourite gold bullion coin, with multiple benchmarks to its credit, such as unsurpassed purity, laser micro-engraving and Bullion DNA anti-counterfeiting technology. The Mint will start shipping this limited edition, 1 oz., 99.99% pure gold coin to official bullion distributors this month. “The Royal Canadian Mint is extremely proud to have distinguished itself as a global market leader by consistently raising the bar on the purity and security of its Gold Maple Leaf bullion coin”, said Jennifer Camelon, Interim President and CEO of the Royal Canadian Mint. Images of this new coin are available here. In keeping with a distribution model common to the world’s major issuers of bullion coins, the Mint does not sell bullion directly to the public. Interested buyers are encouraged to contact a reputable bullion dealer to order these new gold and silver bullion coins. The Royal Canadian Mint is the Crown corporation responsible for the minting and distribution of Canada’s circulation coins. The Mint is recognized as one of the largest and most versatile mints in the world, offering a wide range of specialized, high quality coinage products and related services on an international scale.